The year is 1320 in France, and writing, reading, and the supply of costly parchment are under complete control by an increasingly corrupted Church. When Auda, the daughter of a papermaker in the small town of Narbonne, is born albino, she falls victim to an act of superstitious violence that leaves her a mute. Yet as Auda grows into womanhood, she reclaims her voice using her father’s cheap “cloth parchment” to write troubadour poetry about courtly love. Already shunned by the villagers as witch, Auda continues to draw attention through her unwomanly pursuits, from the interest of the town’s lecherous Vicomte, to a secret band of heretics, to the dreaded Inquisition roaming the French countryside. Ultimately, risking betrayal, torture, and even death, Auda must decide how significant her writing truly is in her quest for love and a sense of selfhood. In the rich historical tradition of Geraldine Brooks and boasting the absorbing period detail of Lisa See’s Snow Flower and the Secret Fan, WATERMARK is an atmospheric and compelling debut novel about the search for identity, the power of self-expression, and value of the written word. “This engaging, clearly written novel pulls readers into a corner of the Middle Ages not often seen: fourteenth-century Narbonne, a city where fear and suspicion mingle with memories of southern France’s troubadour past. The descriptions of daily life in medieval Languedoc are tangible, lyrically phrased, and at times chillingly realistic. In recounting one woman’s journey to discover her literary voice, Vanitha Sankaran evokes a distant era with startling parallels to our time. 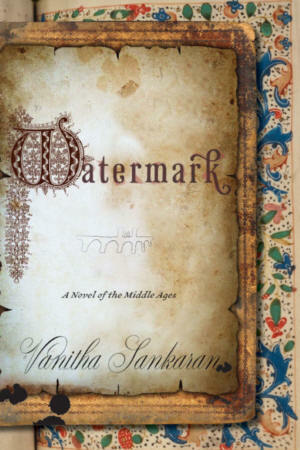 “Watermark is a stunning debut –moving, compelling and illuminating. Vanitha Sankaran has magically captured the lost world of medieval France in all its social, religious and philosophical complexity, and done so with an admirable verve. Peopled with a wide array of compelling characters, Watermark is historical fiction at its best. “An addictively engaging novel, set at a time when reading and writing bloomed—the dawn of papermaking. What book lover could resist?